There is such beauty in the world – even when you are freezing your buns off – LOL! 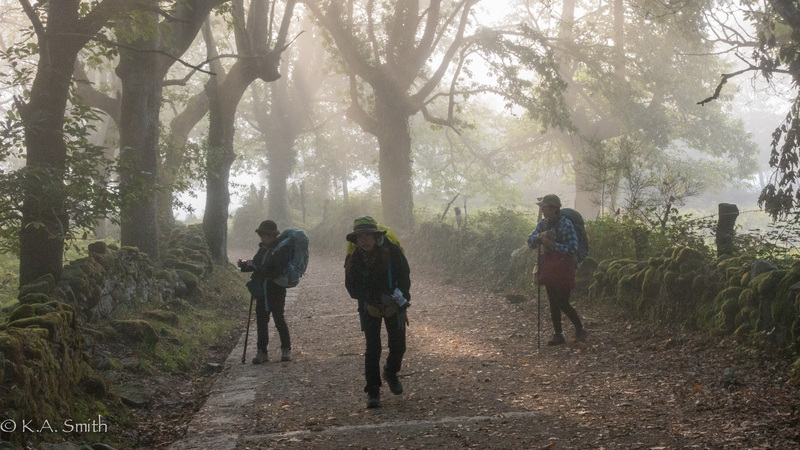 In the month we have been walking the Camino we have literally walked into fall. In the beginning we were surrounded by the bounty of late summer. Blackberries, figs, fennel, gardens bursting with produce, corn rustling in the breeze and grapes ripening slowly in the lazy sunny days. The oak and chestnut were showing their bounty but not yet ready to share. Pumpkins were starting to peek out from the sinuous vines and the cabbage were plumping up. The weather was hot, stiflingly so some afternoons and the air was perfumed with a thousand rich scents. Early mornings, starting out to walk the days’ trail were crisp and fresh, and the sun rose long before we stepped out. There were times when the dust and heat were just too much and the glare from the sun was oppressive but the end of summer always has to have a few last gasps to remind you of what is passing. A soft day with the sun just starting to glow. Gradually we have travelled into autumn with an awareness of the passage of the seasons that I think can only be experienced if life has slowed down to our pace. Perhaps the farmers are as aware but then they are also aware of all that must be brought in, harvested, put up and stored for winter to fully appreciate this slow, majestic and inexorable change. A different kind of spider web. The blackberries are all finished, the figs harvested and the gardens are bare earth or shaggy late season hardy veggies. The pumpkins here are huge and no longer peeking out from the vines but sitting importantly above everything. The corn has pretty much been harvested, the corn cribs are full and the rest is chopped up and turning into silage for the cows. The most noticeable development are the oaks and chestnuts – those barely visible nuts have become an embarrassment of riches. 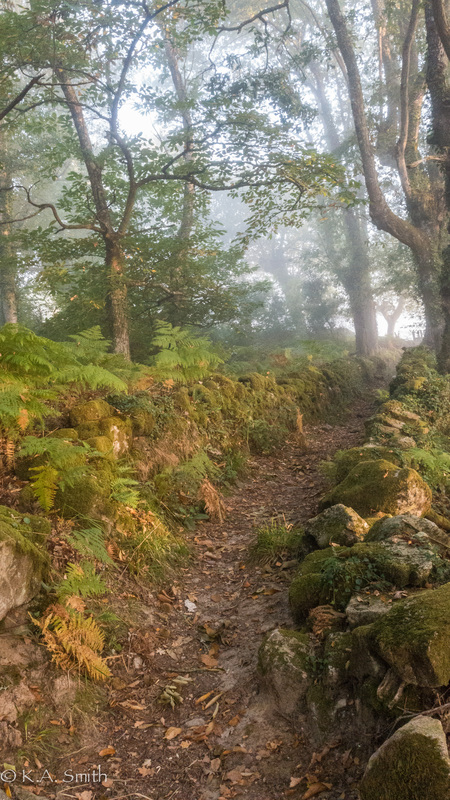 Walking the back lanes requires a whole new level of caution; the acorns roll and crackle under foot and the chestnuts become green grenades hurtling out of the trees. Hazardous to ones health! 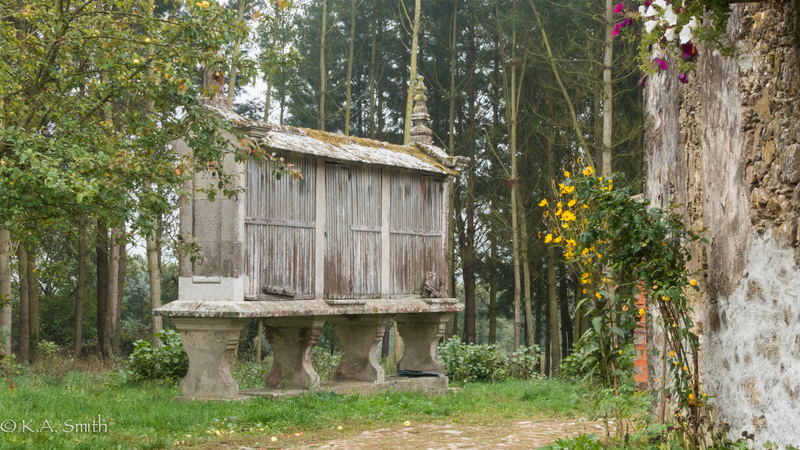 A Spanish Corn crib called a “Horreos”. Of course our weather has changed dramatically too. Sunrise is often long after we start walking, its’ bitterly cold then and for the last several days the morning fog has been heavy and lingering. 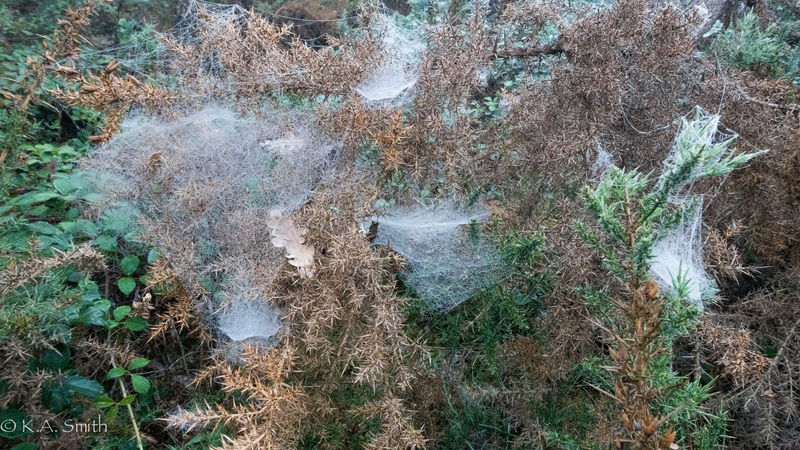 I think it is pretty walking in the fog; the spider webs are spangled with the dew and the light glows with the sunrise. 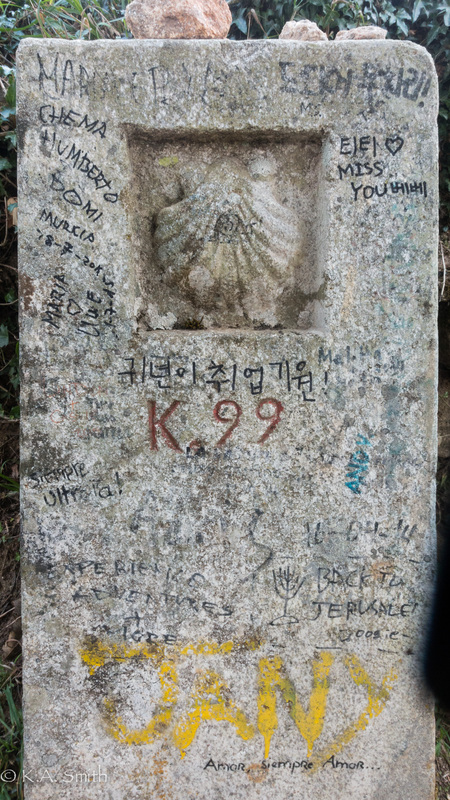 Walking is soft and quiet, voices are instinctively hushed and conversation is muted – mostly. By mid-afternoon the sun is again warm enough to raise a sweat under your backpack and a cool drink of water is a thing of beauty. 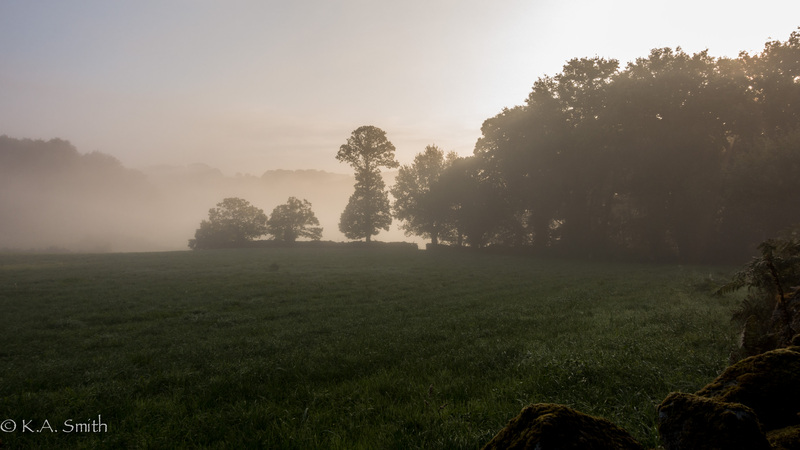 Everyone walks softly and talks quietly in the morning mists. YAH!!! We are down to the last 100 km. I’m going to be sad when it finally ends. We are now only about 65/70 km. from Santiago and are hitting the first really bad weather we’ve had so far. Slashing rain which gets into and under everything, gusty, blustery winds and a weather forecast which promises more of the same until we get to Santiago on Friday. Then of course it supposed to be sun and 18 c.! 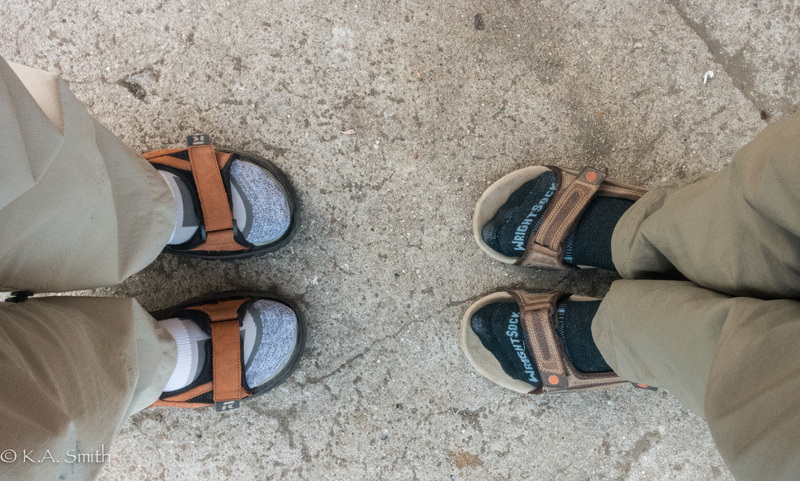 Oh the depths we have sunk to – socks and sandals! We may never be stylish again – horrors!!!! Apart from all the other myriad benefits of this journey, surely this procession of the seasons will always rank high in my memories. p.s. having uploading issues again – sigh… more pictures another day!